Nothing announces, "It's spring!" like flowers. 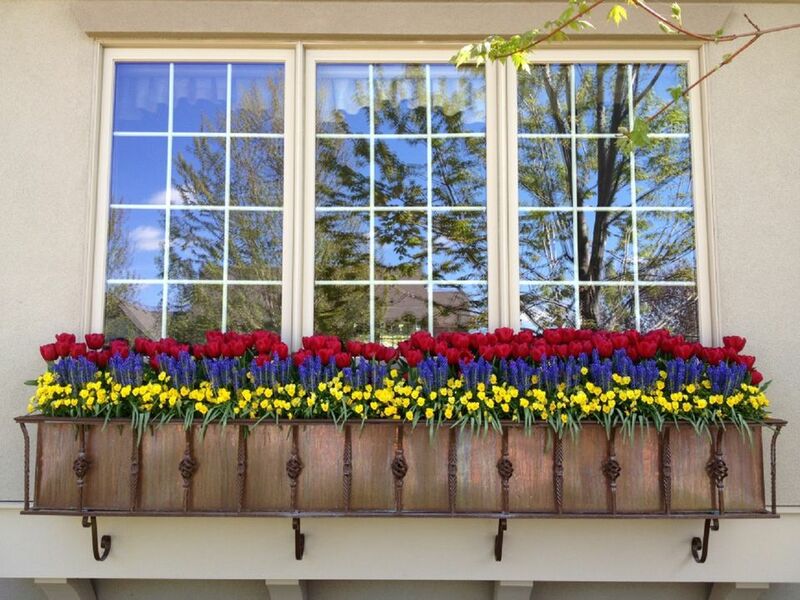 If those early season flowers are in window boxes, they are on display for everyone to enjoy; consider it something you're doing to bring a little joy to the neighborhood in which you live. Add fresh outdoor potting soil to the box and mix it with existing soil before planting flowers, grasses, bulbs, or succulents. Using the thriller, filler, spiller formula, approach the window box as a wide floral arrangement, with taller plants in the back (the thrillers), medium-height, densely packed plants in the middle (fillers), and trailing plants on the edges and at the front (the spillers). Let's take a look at 15 spring window designs that will spark your imagination. After a few months of empty window boxes, Elizabeth of Pretty Pink Tulips is always excited about displaying signs of spring. For this particular year, "the vision was soft and storybook," she says. This was achieved with cascading ivy, ferns, and pale yellow pansies–all planted to coordinate with Elizabeth's signature tulips which hadn't bloomed yet. Elizabeth got help from Cindy Mills of Gardens, who helps with ideas and maintenance at her home on Long Island in New York. Yellow, white, purple, and touches of new-growth green send a colorful message that spring has arrived. Following the container design theory of thrillers, fillers, and spillers, the flowers in this window box pop against the black wood shutters. In back are yellow calla lilies (thrillers), while fluffy yellow and white hydrangeas inhabit most of the box (fillers). Spilling over the sides and front are tiny-white bacopa (spillers). A lush box filled with rich colors from plants like variegated coleus, million bells (a cousin of petunias that produces smaller flowers), vinca, and asparagus fern. A mass of petunias in lavenders, purples, and magentas overflow this box in spring. If possible, try to maintain by deadheading or using fine gardening snips to clip off spent blooms and allow more to grow. 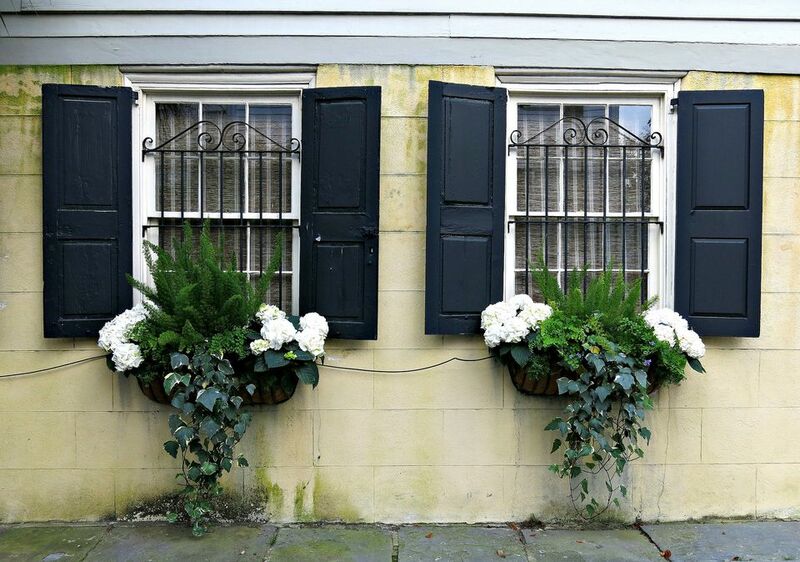 Plants with white flowers, like petunias, begonias, Angelonia angustifolia "Archangel White," and sweet alyssum are arranged symmetrically and provide contrast with black shutters against a white-painted brick house with white wood trim. The light chartreuse foliage is stonecrop or Sedum Angelina. Waiting to bloom in the center is a spring-blooming bulb—probably ​Ornithogalum, or Star-of-Bethlehem. Subscribing to the "more is more" theory, the designer of this window box celebrates spring with just about everything blooming that will fit in the box, including pansies, geraniums, and snapdragons. Spilling white bacopa is misted with Dusty Miller, daisy-like fleabane, and purple million bells for a wide, spreading box that will grow fuller in the coming months of spring. A variety of succulents packed into a window box in the fall will continue to grow throughout the winter. By early spring, they will look their best, with some producing flowers. Succulents in this box include: kalanchoe (felt plant), pink echeveria, crassula, and pencil plant (euphorbia). Plant what works well in your region, placing taller specimens in the back, fuller ones in the middle, and spillers at the front and sides. Perky ranunculus in eye-catching bright dark pinks and oranges grace the back of this New York window box and are visible from the street. Brooklyn Window Boxes by Flo's Gardens specializes in window boxes and urban container gardens. A month or so into spring, Elizabeth of Pretty Pink Tulips has changed out those pale white pansies for hydrangeas in bold dark pinks, which complement her in-bloom pink tulips that grow throughout the garden of her New York house. Speaking of tulips, Botanical Blitz strategically placed these deep red beauties to stand tall at the back of a window box in Minnesota, while dark purple heliotrope grow at the front of the box. Sometimes, less is more. In this case, a fast-growing and -spreading red rose mounds and spills out of this window box with dozens of traffic-stopping blossoms. Deadheading will continue the display. Two trumpet-shaped Easter lily (Lilium longiflorum) plants rise above the English ivy and pink hyacinths in this early spring planter. Both the lily and hyacinth are bulb flowers.